Copper is a highly important commodity used in trades such as electricity, construction, and manufacturing. The reason for which it is such a widely used metal is that it resists corrosion efficiently and is a highly effective conductor of heat and electricity. Copper trading can be carried out in futures. This can be done at the LME (London Metal Exchange) and the NYMEX (New York Mercantile Exchange). 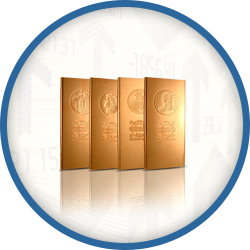 Most binary options brokers will allow Online copper trading on their platforms. Copper trading is less common when compared to other commodities, and so online copper trading is susceptible to high levels of volatility, due to its low and irrational levels of demand. The futures prices for copper on the LME normally follow the dollars,cents/metric ton format – they are usually traded in 25-ton lot sizes. The futures prices for copper on NYMEX follow the dollars,cents/pound format and are usually traded by 25000-pound units. In order to know how to trade copper efficiently, one must examine the factors which influence the prices of this commodity, and by consequence copper trading. The price of copper is therefore influenced by factors surrounding its demand for items in high production such as circuit boards, microwave ovens, wiring, and more. Another important factor involves a recent development in regards to copper’s classification as antimicrobial which means that the metal’s demand could rise for production in germ-sensitive spaces. Through this page, you will be able to consult charts and graphs in order to gather as much information for how to trade copper efficiently.